Looking for an action-packed excursion in Wales? 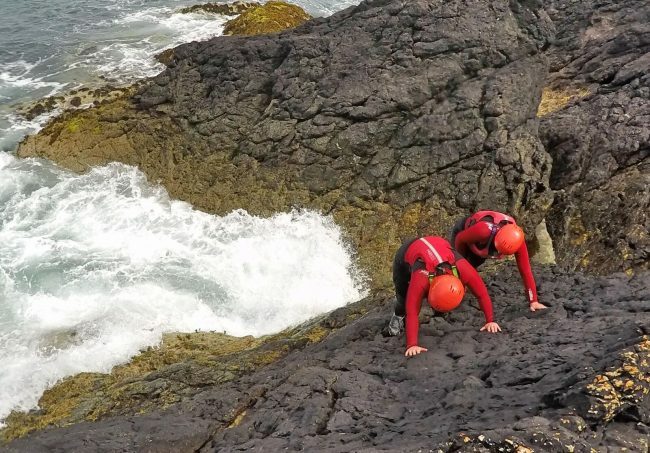 Check out coasteering, a sport that follows a rocky coastline both in the water and out. It’s an energizing mix of swimming, scrambling, leaping and caving – and Wales is the birthplace of the sport. I’m balanced on a stone, eyeing a water worn gully between slippery rock walls and debating the best way to get down to it. 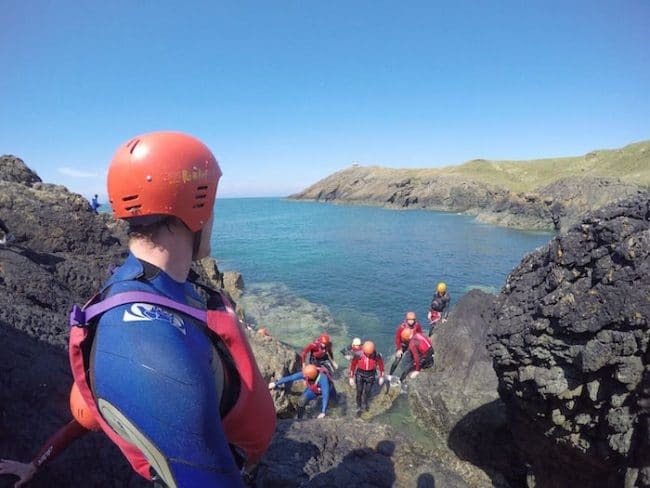 “You can use my shoulder as a stepping stone,” says Chris Thorne, owner of Snowdonia Watersports and the guide for our group’s coasteering tour in Anglesey, North Wales. I step forward, slip and do the splits over his shoulder. “Awkward!” I say, my face turning pink. It’s nice to get to know your guide on a Welsh outdoor adventure, but this is a tad more intimate than I had in mind. I slink down into the water, half swim half walk through the narrow gap then float in the sea, the soft swell rolling under me. “Is that the worst thing that’s happened to you while guiding a coasteering trip?” I ask Chris, still embarrassed. At least I’m not alone in my less than stellar climbing skills. It’s reassuring to know that when it comes to coasteering you don’t have to be perfect, you just have to be up for a challenge and curious to experience a new way to connect with the landscape. Our small group has every skill level imaginable, from someone who doesn’t want to ruin her hair (oh, wait, is that me?) to a Norwegian adrenaline junkie who wouldn’t think twice about doing high octane flips off a sea cliff. 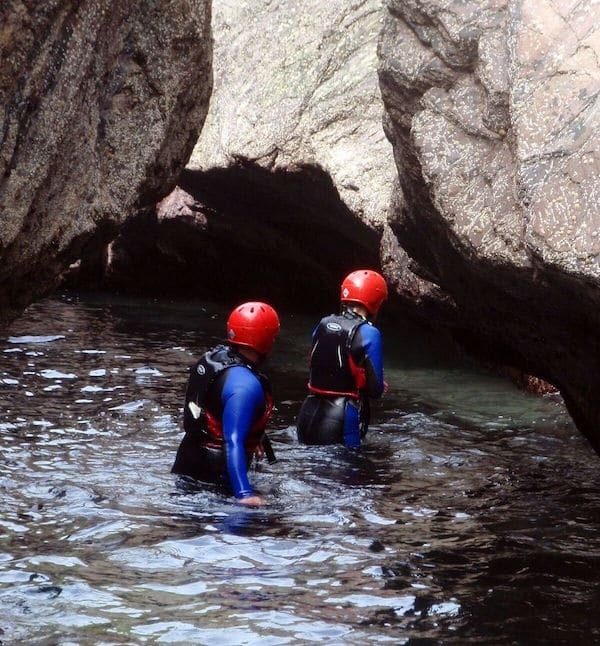 Coasteering is a unique sport that got its start in Pembrokeshire in southwest Wales, and has become a popular outdoor activity in the UK. Think of it as an extreme version of a coastal walk – or splash – and it’s always different depending on tides, weather and season. You’ll be kitted out with a wetsuit, life jacket and helmet, and it’s important to go with an experienced guide. According to Chris, who I enjoyed pestering with questions, it’s tailor made for people who want something new. “Once people have tried kayaking and canoeing,” he says, they’re looking for something different.” It’s definitely a novel way to experience the wilds of Wales. Our trip with Snowdonia Watersports is a two-hour excursion that started in Porth Dafarch, a sandy bay on Holy Island in Anglesey. I’m opting for the scaredy-cat version, sliding off only the lowest rocks into the sea, and scrambling around using my hands as much as my feet. Even so, it’s tricky. Kelp and bladderwrack make wet stones slippery, barnacles make them sharp and in some places the quartzite rock is so jagged it looks like a row of sediment-encrusted combs. But whether you consider coasteering the ultimate adventure sport or a walk in a park, it’s hard not to be blown away by the unique perspective of seeing a craggy coastline from sea level and, if you’re lucky, you can spot dolphins, seals or peregrine falcons. Soon we come to a zawn, a narrow inlet cut by erosion. Sloping rock walls have formed a claustrophobic triangle that comes to a point just over our heads, and the only way to get through is to go under water. “Nope, not for me,” says one man in our group who opts to swim around it. Taking a deep breath, I plunge under and reach for the outstretched hand of Caroline, a Danish athlete who looks like a Sport Illustrated model, and who has opted to help pull us out. She tugs while Chris pushes. Thump, thump, thump, my helmet bangs against the rocky walls as I plow through the tiny opening and pop out to freedom. “Whoohoo!” I shout, accidentally giving myself a mouth full of water. “Blech,” I say, spitting it out. Swimming across an inlet I start clambering up the barnacle-encrusted rocks. My hands find a grip but a swell dislodges me. The next time I’m almost home free, standing vertical on the rock face when a wave drags me down. “Noooo!” I say, my bare hands scraping over barnacles as I do a slow motion slide down the rock. Finally I manage to scramble up successfully, none the worse for wear except for a few barnacle scrapes on my palms, which, I’m told, are practically a rite of passage in the coasteering world. We’re in the home stretch and I’m ready to stagger out of the water like some wetsuit-clad parody of sea-to-land evolution, but Chris opts for a grand finale. “Ready for a final jump?” he asks. As per usual I scrounge around, poking a toe in the water, looking for the easiest way in. “Group jump!” Caroline says, aiming for a rocky platform that looks perilously high (though thankfully it’s not the highest). She links hands with the other two women in our group and they look at me expectantly. “Noooo,” I say, shaking my helmeted head. Squeezy little caves I can do. Slippery rock faces, no problem. Scary jumpy things? Not so much. I sigh in defeat. I don’t want to be the only one not jumping (yes, I do). I link hands, let out a terrified screech and leap into nothingness before plunging into the cool blue sea. Bubbles flood past my face as I start to rise, suddenly remembering that diving into the depths is a literary metaphor for transformation. I burst out of the water, looking forward to meeting the new me. Snowdonia Watersports offers a number of outdoor excursions including kayaking, canoeing, stand-up paddleboarding, rock climbing, hill walking, coasteering and gorge walking. 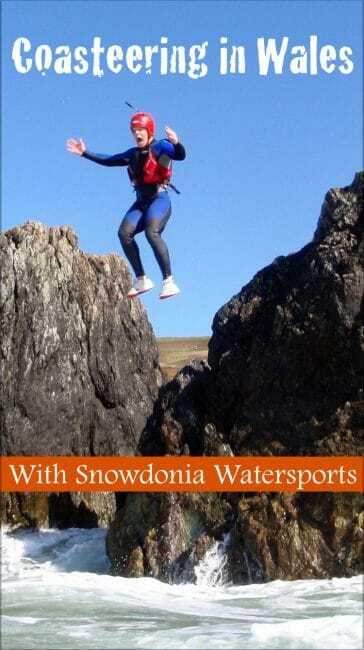 The best way to contact them is through their Facebook page or email them at info@snowdoniawatersports.com. Coasteering trips cost between 40£ and 60£ pp. Pickup is usually from the McDonalds’ carpark in Holyhead (Postcode LL65 2H7), but you can discuss that with them. Getting to Holyhead: Surprisingly, Holyhead in North Wales is just over 4 hours from London by train and 3 hours from Manchester. To explore the area of Snowdonia, however, it’s best to have a car. What do you need to bring for coasteering? Old runners you don’t mind getting wet. A bathing suit to wear under your wetsuit. A towel. A GoPro would be handy – I say this as I didn’t have one so have had to scrounge around begging for photos. Wetsuits, helmets and life jackets are provided. Do you need to take huge leaps off cliffs? Not if you don’t want to. Who’s a good fit for coasteering? Most people who try it are first timers, so no experience is necessary. Even families can do it (certain age restrictions apply). This is why it’s important to go with a skilled guide who knows the terrain and tides. My coasteering in Snowdonia excursion was hosted by VisitWales and VisitBritain. 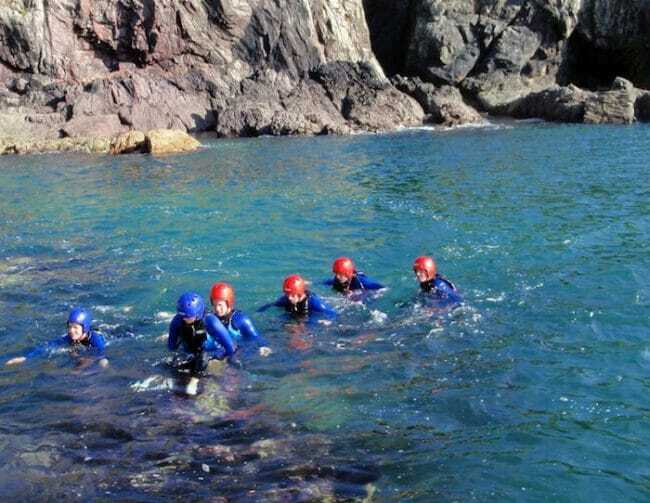 Find out more about coasteering destinations on this VisitWales page. All triumphant cliff jumping, water swallowing and opinions are my own. You’ll find more about top European destinations here. It’s true, Patricia. Coasteering shows you the landscape from a very different angle. It’s a crazy fun outdoor adventure if you like the sea and the coast, Aleah. 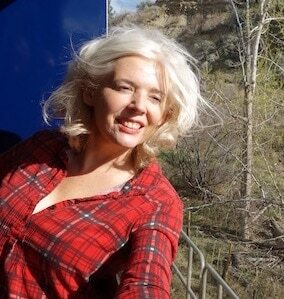 Wales is made for adventure travel, Sara! You are the best, Christopher. Thanks. This is a fantastic review. I love how you started it and I love the fact that you included your conversation with Chris. That’s funny, an occasional bum in the face! Haha. The sport itself I never heard of till now. This looks like so much fun, something I would totally want to try out. “shaking my helmeted head” hahahaha. Your too much!! Did I ever tell you how much I Love love love your writing? I must admit I don’t think adventure travel when I think of Wales. Therefore finding out that they invented coasteering is really quite cool. I’m exhausted just reading about you scrambling, diving and whacking your helmet. But wow, what an incredible adventure. How cool! I’ve never heard of this before but I’d love to give it a try. It looks like a lot of fun! I’ve never heard of coasteering before but as an adventure traveler, this looks very much up my alley. I would love to take this when I’m in that corner of the world! Sounds like fun! So, how’s the new you after that jump? :D Made me laugh with the slip over the guide’s shoulder as well. Nice little adventure you didn’t seem to be prepared for, but came out just lovely, right! :) That last jump is definitely my favorite. I’ve never heard of coasteering, but wow you sound super brave to me. I think Andy might be up for this challenge, but I couldn’t even manage to kayak properly. Still, I can see why it would be exciting, and you are certainly seeing the terrain in a whole new way. 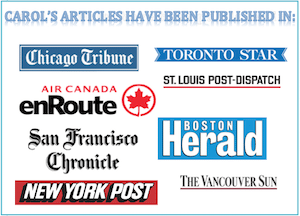 Bravo to you! I’m the least brave person I know, Fiona. And I’ve done it twice! Thanks, Roff! I hope you give a coasteering trip a try. LOL well done you! I really don’t think I’d be brave enough to try coasteering!